Pulau Ubin is home to 75 kampung houses and structures but only one building on the isle is conserved - a colonial 1930s Tudor-style house on its eastern tip. Now, effort is being ramped up to look into the restoration of Pulau Ubin's forgotten and neglected traditional kampung houses. The National Parks Board (NParks) told The Straits Times on Friday that five vacant kampung houses have been identified for restoration and the authorities are "engaging the community on the design and scope of the restoration works". They are Chinese kampung houses 63C and 425B, and Malay houses 6J, 22E and 846P. These houses are scattered across the island and will be restored for community use. The community can propose how these sites will be used. House 22E is one of four raised-floor or panggung Malay kampung houses being studied by a team from the National University of Singapore's Department of Architecture. Since last November, the team has been documenting the traditional construction methods and characteristics of the occupied kampung houses of 456, 488A and 760D located within Ubin's Kampung Sungei Durian; as well as the vacant House 22E - the last structure in Kampung Surau. Led by Assistant Professor Imran Tajudeen, the architecture graduates are in the midst of piecing together a proposal with recommendations on how best to restore these structures. They said it is the first time that Pulau Ubin's Malay kampung houses are being studied and documented. They will submit a paper on their findings to the Ministry of National Development and NParks later this year. Dr Adrian Loo, NParks' group director of conservation, said the project, which was initiated by NUS' Department of Architecture, "will provide a baseline reference for future restoration works" of the kampung houses. NParks previously identified House 63C for restoration in an announcement last July on a multi-year kampung house restoration effort. First built in the 1930s, House 63C near the island's jetty, was the home of Mr Tan Bak Tee and his family for 50 years. The NUS team's project, which started out as work for an architecture module, focused on the structure and construction of the houses, and the materials and extent of restoration required. The team also mapped out the interior layouts of each of the four houses. Dr Imran believes this work is urgent. He said the community, cultural and built heritage of the island has been neglected for decades since plans for Ubin have generally focused on the island operating as a recreational park and nature site. Team member Lee Kah Hui, 22, a research assistant under Dr Imran, highlighted the urgent need to act to keep Singapore's last offshore kampung alive. She noted that 83-year-old Mr Ahmad Kassim of House 488A is one of the last remaining Malay Ubin residents who remembers how to construct traditional vernacular kampung houses and is an expert on wood types and the island's trees. She said: "Since no one is practising this form of building, knowledge is fading." The team also recommends restoring all the island's homes "as soon as possible" since many of them are suffering from issues such as termite infestations. Former resident Rugaiyah Kasah, 77, a retired clerical officer, who now lives on mainland Singapore, used to spend her weekends at Kampung Surau's House 22E with her family. She estimates it would cost about $50,000 to restore the structure. A chunk of the money would be used to source and purchase appropriate wood such as teak planks known as papan jati to replace the structure's damaged floor boards, as well as on hiring transport to ferry supplies to the island. Kampung Surau residents were evicted in the 1990s, because of plans to redevelop the site into a resort although this did not materialise, noted the team. Madam Rugaiyah hopes to spend her weekends there once again: "It is my wish for the house to be restored. It is irreplaceable." The team added that it believes Pulau Ubin, which is designated as a reserve site on the Urban Redevelopment Authority (URA) Masterplan, should eventually have specific settlement areas set aside as conservation zones - much like the more than 20 other places the URA has gazetted so far. These include historic districts such as Little India, the secondary settlement of Geylang, and Sentosa. 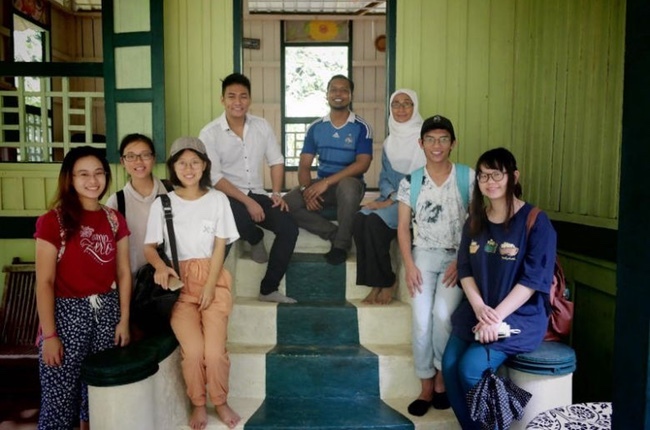 Project member Ahmad Osman, 25, now an architectural conservation consultant, said it is crucial that Singapore's last offshore kampung is provided with the right conditions to flourish. Mr Ahmad said: "Ubin is home to authentic kampung structures. As a modern country, we have forgotten about our kampung past and younger Singaporeans know very little about how they were built and what the lifestyle was like. We cannot let kampung life on Pulau Ubin just fade away."